If you're giving gift cards this holiday season, they've probably come in utilitarian envelopes in which to give them. 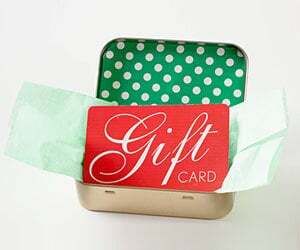 For something a bit different--and MUCH more memorable--how about presenting those gift cards in an empty Altoid tin? BHG suggests we cover the cover in pretty paper to hide the 'toid part. Make a Pop-Up Reindeer Card. Matthew Reinhart and Robert Sabuda are master pop-up artists, and here they share tips and templates for making a pop-reindeer for holiday greetings. How To Make A Gift Box From an Old Greeting Card. A gift box from a greeting card: easy, free, and recycled. Can't beat that. Read all the instructions from CraftyPod.